This article provides an update on the delivery of apprenticeships by London boroughs in 2017-18 following an annual data collection exercise. The data shows there has been a 25% increase in the total number of apprenticeships delivered by boroughs compared to last year. 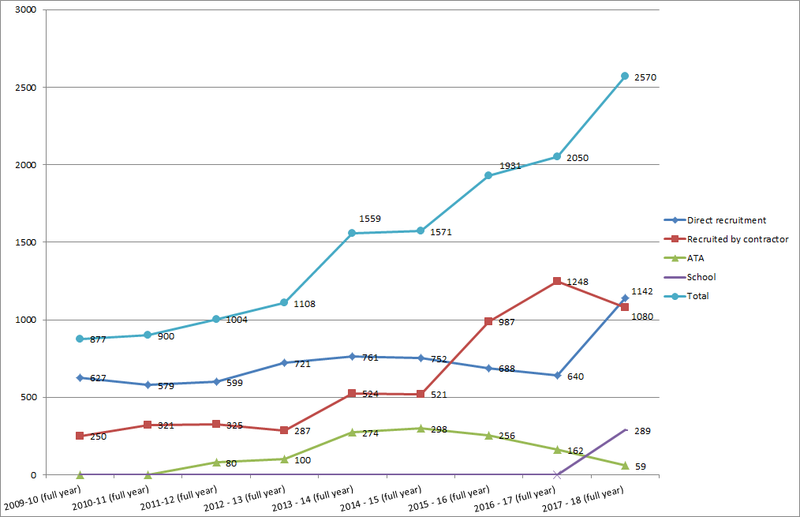 The total number of apprenticeships generated by boroughs, their contractors and ATAs since 2009 now stands at 13,570. The number of apprentices directly recruited by boroughs. The number of apprentices recruited by contractors that deliver services on behalf of a borough. The number of apprentices placed with ATAs where boroughs pay the salary and provide the placements for, but do not employ the apprentice. In each case, London Councils also requests data from boroughs on the age and level of each apprentice and the number of apprentices in each category who were previously NEET (not in employment, education or training). This year London Councils has also gathered information on how boroughs are performing against the public sector apprenticeship target and delivery of apprenticeships in schools. Overall, the total number of apprenticeships has continued to rise each year since 2010-2011. This year’s increase is driven by an 78% increase in the number of apprenticeships created directly within London boroughs. There was a 13% drop in apprenticeships created within the supply chain following a 26% increase the year before. Eight boroughs were able to report on this. ATA recruitment has fallen again this year as less boroughs use this method of recruitment. Most boroughs were able to provide a comprehensive breakdown on age of the apprentices recruited. Overall the age profile of apprentices largely mirrors national trends, whereas in previous years the age profile of apprentices was significantly lower than national averages. London boroughs have embraced apprenticeships for all ages, with a 345% increase in over-24s compared to last year. Two-thirds of boroughs reported on the level of study for their apprentices. 42% of apprentices were recruited at level 2 (627), 45% of apprentices were recruited at level 3 (684), 10% of apprentices were recruited at levels 4 & 5 (154), with just 3% offered at a higher level (47). Whilst there has been some shift towards higher level apprenticeships, London boroughs remain below the national average. 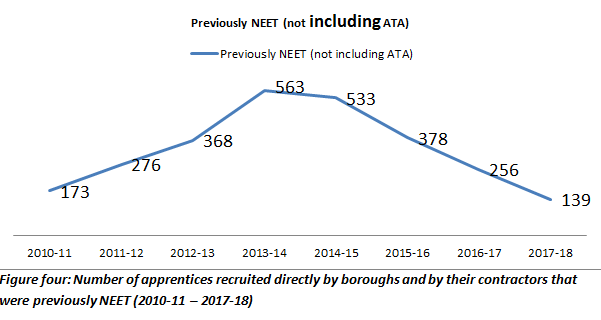 There has been a noticeable decline in the number of apprentices reported as previously NEET (not in employment, education or training) by borough, a continuing trend for 2013-14. There is significant variation in the number of apprentices recruited by each borough, which can be due to a number of different factors including the maturity of a borough’s apprenticeship programme, planning and delivery structures, demand for apprenticeships within the organisation and amongst local employers, the ability to recruit appropriate apprentices, ability to source appropriate training and levels of engagement. Four boroughs were able to meet or exceed the 2.3% public sector apprenticeship target in 2017-18. Despite the 78% increase in directly recruited apprentices, collectively London boroughs would have needed to create an additional 1667 apprenticeships to achieve this target. While the impact of the apprenticeship levy has resulted in a decline of apprenticeship starts across England, London boroughs have bucked this trend- increasing the total number of apprenticeships created through their efforts by 25%. This shows the value London boroughs have towards apprenticeships and the drive to create opportunities locally, 13,570 since 2009. The large increase in apprenticeships created directly within London boroughs reflects the focus of levy payers on spending their corporate levy pot before the 24 month point when funds are withdrawn. Although there was a 13.5% decrease in the number of apprentices recruited in the supply chain, London Councils believe this area remains under-reported and does not accurately represent the opportunities created by boroughs through relationships with their contractors. London Councils welcome last week’s announcement from the Chancellor to raise the cap on the amount of levy employers can transfer to their supply chain from 10% to 25%. Not only will this enable boroughs to support workforce development across their contractors and commissioned services, it will also enable other employers in key sectors with large supply chains to create more apprenticeships. Under-reporting may also account for the drop in apprentices recorded as NEET prior to employment. Only 10 boroughs provided this data, down from 13 in 2016-17 and far below the 23 boroughs who reported on this in 2014-15. Although only 3% of apprenticeships created by boroughs were of a higher level, London Councils expect this to grow as relevant apprenticeship standards become available for delivery such as Social Worker, Chartered Town Planner and Youth Worker. Following the first year London boroughs have been working towards the public sector target, London Councils estimate that an additional 1667 opportunities would have needed to be created to collectively meet the target. This is an extremely challenging, possibly unrealistic target that will be hard to sustain and which was only achieved by four boroughs in 2017-18.